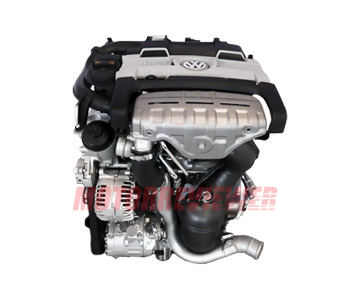 The 1.4 TSI/TFSI engine belongs to the EA111 series of turbocharged gasoline engines. The engine was introduced for the first time at Frankfurt Motor Show in 2005 as an example of displacement downsizing direction of the VW’s engine development. The main target for the small turbocharged engines was the replacement for 1.6 FSI and 2.0-liter FSI naturally aspirated engines without loosing in power and torque at the same time providing more fuel efficiency and better emissions standards. The 1.4 TSI and 1.2 TSI engines are most common power unites for VW’s hatchbacks Golf and Polo, and also for compact sedans Jetta. The 1.4 TSI EA111 engine has cast iron cylinder block with 82 mm (3.23 in) cylinder spacing. There is die-forged steel crankshaft on five main bearings. The engine has 16-valve (four valves per cylinder) aluminum cylinder head with intake and exhaust camshafts on top. The camshafts are driven by a roller timing chain designed for entire engine life. But in reality, this chain will stretch out somewhere after 60k miles – long before the engine lifespan end. This version also equipped with continuous adjusting variable intake valve timing system. The valves are actuated by roller finger cam followers equipped with hydraulic tappets/lifters for valve clearance compensation. All 1.4 TSI engines have throttle body with electronically controlled Bosch "E-Gas" throttle valve. The important component of the engine is the turbocharger. There are two different versions of the 1.4 TSI. The less-powerful version equipped with one TD02 turbocharger produced maximum boost pressure 1.8 bars (26.1 psi) and water-cooled intercooler integrated into the intake manifold. The power range for those engines is between 122-131 hp (90-96 kW). The more powerful versions have belt-driven fifth-generation Eaton Roots-type supercharger in addition to KKK K03 turbocharger. That combination eliminates the turbo lag appearance and produces significantly more power and torque. The TFSI versions have VW’s Fuel Stratified Injection (FSI) system. The fuel delivery is provided by low-pressure pump inside the fuel tank and camshaft-driven single-piston high-pressure injection pump supplied up to 150 bars (2,180 psi) fuel pressure for the six-hole fuel injectors. The fuel is injected directly inside the combustion chamber of each cylinder. The NGK spark plugs are positioned in the center, between the intakes and exhaust valves. Each spark plug has an individual ignition coil. The engine operation is controlled by Bosch Motronic ME electronic engine control unit (ECU). The EA111 1.4l engine is the multiple time winner of the ‘International Engine of the Year’ award. Despite this fact, Volkswagen replaces this engine with a more technologically advanced 1.4 TSI of the EA211 series. 1. Timing chain and tensioner noise is the widespread issue for the 1.4 TSI engine. One of them (or both) needs in the replacement as soon as possible. 2. A car doesn’t accelerate well. Very often, that is a problem with Wastegate in the turbocharger. 3. VW-AUDI 1.4 TSI engines don’t warm up well and like to eat oil. That is unique features. The 1.4 TSI engine with proper maintenance can run up to 200,000 miles with no damages or issues. CAXA - 122 hp (90kW), 148 ft lb (200Nm) at 1,500-3,500 rpm. This is the popular 122-hp version of the 1.4-liter TSI engine with one turbocharger. CAXC - 125 hp (92kW), 148 ft lb (200Nm) at 1,500-4,000 rpm. The engine is for Audi A3, SEAT Leon. CFBA - 131 hp (96kW), 160 ft lb (220Nm) at 1,750-3,500 rpm. This version is for VW Jetta V, Golf Mk6, Passat B6, and Skoda Octavia Mk2. BMY - 140 hp (103kW), 162 ft lb (220Nm) at 1,750-5,000 rpm. The engine has mechanical supercharger and turbocharger produced pressure of 2.5 bar. CAVF - 150 hp (110kW), 162 ft lb (220Nm) at 1,250-4,500 rpm. The SEAT Ibiza FR has this version. BWK/CAVA - 150 hp (110kW), 177 ft lb (240Nm) at 1,750-4,000 rpm. More torque engine for the VW Tiguan. CDGA - 150 hp (110kW), 177 ft lb (240Nm) at 1,750-4,000 rpm. Application: VW Touran, Passat B7 EcoFuel. CAVD - 160 hp (118kW), 177 ft lb (240Nm) at 1,750-4,500 rpm. Special version for hot hatches and compact sedans such as Golf Mk6, Scirocco Mk3, VW Jetta TSI Sport. CAVE/CTHE - 179 hp (132kW), 184 ft lb (250Nm) at 2,000-4,500 rpm. The most powerful engine of the 1.4-liter series was designed for SEAT Ibiza Cupra, Polo GTI, Fabia RS, and Audi A1.